We are about to become great friends. I plan on sharing my style secrets, or lack thereof, as I spend the next year revamping my style and wardrobe. I am in my mid-thirties but I dress like I am 12. I have had the same hairstyle, wardrobe, and attitude about clothing for as long as I can remember: Buy for comfort and what you can afford. 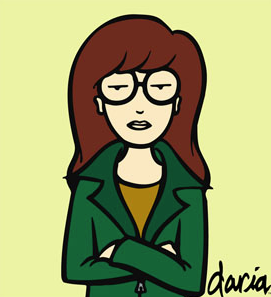 My wardrobe channels Daria Morgendorffer, wear the same thing day after day and try not to get noticed. I work at a super creative job where I rarely meet with clients and sit in a bottom level basement where dress is casual and I’m surrounded by guys. What brought on this change? I have recently become fascinated with the world of new wave French cinema and desire to live the lifestyles portrayed in these films. A few months back, I watched a film called La Piscine. I had no idea who the beautiful young actress in the film was and after doing some research, learning that it was Jane Birkin, Charlotte Gainsbourg’s mother and I guess more importantly, the muse behind the Birkin Bag. The Birkin what? I felt like an idiot reading about all this high fashion jargon that I knew nothing about. I felt so completely out of the loop. The more I researched online, the more I started to learn about the simple chic wardrobes of French women. And interestingly enough, a wardrobe that hasn’t changed much in decades. For the most part, with a little bit of research, the idea of a classic and timeless French wardrobe seems attainable. I’d like to take on the challenge of transforming my plain Jane wardrobe and lifestyle to a super chic and sophisticated wardrobe that rivals the closets of Jane Birkin and Anna Karina. Why a challenge you ask, if all the information is available on the web. Why not a huge shopping spree? Well old habits die hard. It takes time to develop good strong habits. Plus, I’m not rich! I think part of owning and developing a new style is that it has to be earned in order to be appreciated. Now that also doesn’t mean that I won’t shop sales and try to look expensive for less. I just want to be smart about my purchases because I will have to get rid of a ton of stuff that I’ve been hanging on to for a few years. I hope to learn a lot of new info along the way and the first big step is to face the facts. That fact is my closet and over the next few weeks, I will be analyzing what went wrong in the first place and see how I can improve, salvage, mock, whatever! One last bit of information that I’d like to share. I’m not a model nor do I strive to be one. I am your everyday, run of the mill, non-perfect looking lady. I’m 4’11” so finding the right fitting clothes has and always will be a challenge, regardless of the petite shops popping up all over mainstream America. I do not have a tailor nor do I plan on getting one. You always hear, ‘oh a tailor this and a tailor that’. How about the fact that I make a modest living, paying off a student loan equivalent to a Mercedes or two over the next 28 years. I know no one in the fashion industry and don’t expect to get any outside help, personal shoppers, promotions, nada! I am your average chick about to educate myself through online research, what I believe will be the best and smartest style choices.